The Market Report: Memorabilia: Pathmark Again! A few weeks ago, we saw the label of a Pathmark white vinegar bottle. Now we're going to see another Pathmark product from probably a little earlier, between 2000 and 2005. 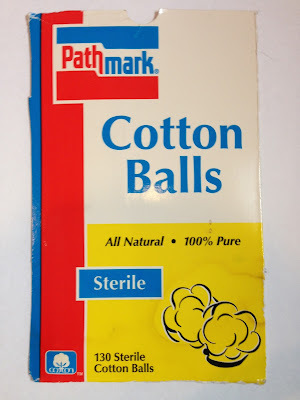 This is the front panel of a box of cotton balls. I'm not so sure about that picture of the cotton balls in the bottom right corner -- last time I checked, that's not exactly what cotton balls look like!